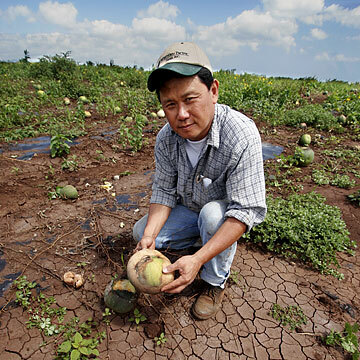 TROUBLE DOWN ON THE FARM: The pumpkin patch at Aloun Farms was ruined by recent heavy rains, with several areas left as patches of sun-baked mud. Mike Sou showed off a rotten pumpkin yesterday. An Ala Wai plunge surely did not help, disease experts say. Many say they are frustrated by spills and contamination. A designer remakes vintage cast-offs into one-of-a-kind clothing. He is getting reps with the first team while waiting for the flood of new football recruits to arrive. Maui Sens. English and Tsutsui lobby to halve a $20 million appropriation for harbor improvements. A bill would let property owners and businesses recoup storm damage costs through an income tax credit.